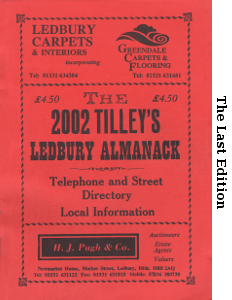 An extract from Tilley’s Ledbury Almanack 1976. It includes all residents with telephones who are listed under Bosbury and four* in Munsley who are listed under Trumpet. Everyone with a Bosbury number but who lives outside Bosbury parish is greyed out. Mrs. M.E. Hone Woodmans, Old Country Mother of T.S.H. This transcription has been prepared with a lot of help on first names provided by Bosbury residents. 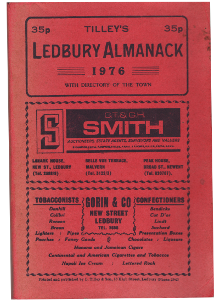 Note: These Almanacks were published regularly and were used and then discarded so are difficult to come by in good condition. 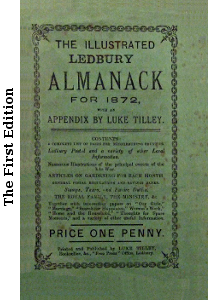 My copy of the 1976 Almanack was purchased from a Herefordshire second-hand bookshop and reference copies are available for study at the Herefordshire Archive and Records Centre in Hereford.